The architecturally popular Four Post Rectangle Shade Structure can become a focal point for many areas that invites year round outdoor activities. 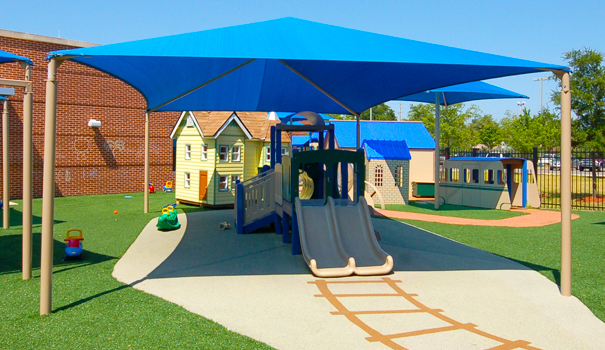 Install Hip style canopies directly over playgrounds, pools, bleachers, picnic areas, to help protect against heat related injuries and cool other site amenities. The Rachel Knitted, non-porous polyethylene fabric allows hot air to rise and escape, ultimately reducing the feel like temperatures, encouraging longer stays. UV stabilized shade material acts as a shield inhibiting exposure to damaging UV rays, preventing premature deterioration of site amenities. State-of-the-art Glide Elbows™ increase the life span of the shade and saves time, effort and money. Glide Elbows™ are a standard hassle free mechanism that allows a quick, secure installation and removal of the shade fabric with a cordless drill or simple wrench. The steel posts and support ribs are fully primed and sealed in a multi-step powder-coated finish, combating rust and corrosion. Because of the strategically placed post locations, a Hip style shade has prime structural and canopy stability and coverage. Hip style shade structures all steel design has been engineered for the rigors of harsh weather and high speed winds, 93mph with fabric attached and 150mph without. In the event of severe weather or need for off season storage, Glide Elbows™ allow a quick, easy and safe removal and reinstall of the shade fabric. To ensure maximum security and stability, it's suggested for these structures to be secured with reinforced concrete footings. The Four Post Shade Structure is ASTM, CSFM and NFPA certified.